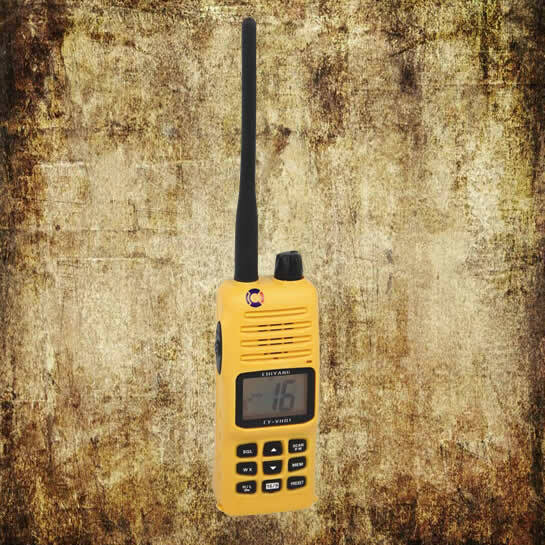 According to the 1983 amendment to the SOLAS regulations 1974 in Chapter III Regulation 6, at least 3 two-way radio telephones shall be provided on every cargo ship of 500 gross tons or more. The two-way radio telephone enables communication between the survival craft, the ship,and the rescue boat. Precautions shall be taken to prevent the inadvertent selection of VHF channel 16 on equipment capable of being operated on that frequency. A watertight model is required for satisfying GMDSS requirements (1988 amnedment). 1. Resolution A.694(17): General Requirements for Shipboard Radio Equipment Forming Part of The Global Maritime Distress and Safety System (GMDSS) and for Electronic Navigational Aids. 2. Resolution MSC.149(77): Adoption of the Revised Performance Standards for Survival Craft Portable Two-way VHF Radio Telephone Apparatus. 3. IEC 60945:2002/COR 1:2008 Maritime Navigation and Radio Communication Equipment and Systems -General Requirements – Methods of Testing and Required Test Result.